Land Cress, also known as American cress, bank cress, black wood cress, Belle Isle cress, Bermuda cress, early yellowrocket, early wintercress, scurvy cress, creasy greens, and upland cress, is a biennial herb in the family Brassicaceae. It is native to southwestern Europe, but is also cultivated in Florida. As it requires less water than watercress, it is easier to cultivate. Land cress has been cultivated as a leaf vegetable in England since the 17th century. Land cress can be grown easily in any garden. Like watercress, it loves water, but does not do well when partially submerged for long periods of time. This perennial needs full sun and frequent watering in any garden, unless near a direct source of water. Synonyms include Barbarea praecox and Lepidum nativum. Other common names include dryland cress, cassabully, and American watercress. A variegated form is available. Land cress is considered a satisfactory substitute for watercress. It can be used in sandwiches, or salads, or cooked like spinach, or used in soup and fish. 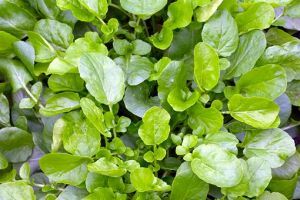 This green leaves have a peppery spinach kale like flavor when cooked and they can also be eaten raw in salads and the yellow flowers are also edible. Land Cress contains lots of vitamin A a powerful antioxidant, B’s vitamins for vitality and to prevent birth defect, vitamin C a powerful antioxidant, vitamin E for heart health, and vitamin K important for clotting. Also iron for anemia and calcium for strong bones. 1. Antioxidants: Land Cress contains twice the Vitamin A found in broccoli, and 3 times that vitamin C found in oranges. 2. Fat - Land Cress is fat free, great for weight loss. 3. Cholesterol - Land Cress is cholesterol free, making important for cardiovascular health. 4. Sodium - Land Cress does not contain any sodium making it great for those on salt restricted diets. 5. Diuretic - Land Cress is a mild diuretic helping to get rid of excess water weight. 6. Lutein - Land Cress contains lots of lutein which is important for preventing macular degeneration. 7. Weight Loss - Land Cress has hardly any carbs making it a wonderful weight loss food. One ounce of Land Cress contains around 10 calories.